The Ultimate Easter Puzzler is a stunning collection of OVER 100 Jigsaws, Spot the Differences, Rotating Tiles and many more Gorgeous and Unique holiday puzzles. With 4 levels of difficulty from Easy to Medium, Hard to Extreme there are Puzzles Galore for all the family to enjoy. 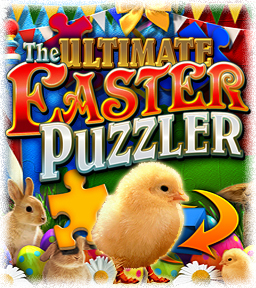 Jigsaws and Rotate games come in 4 varieties for players of all skill levels, each with intuitive controls, hints tips and instructions, box-lid-like picture previews and picture perfect views of each of the stunning Easter scenes once the jigsaws and rotating tile puzzles are completed. The Other puzzle categories include a variety of puzzles such as Matching Pairs, Spot the Difference, Keys and Combinations, Trace the Wires and unique Memory games. So sit back, relax and enjoy these Terrific Brain Teasers, Hour after Hour, Year after Year, alone or with Family and Friends.